Support for Windows XP has ended, and, although unofficial service packs exist, a better and safer idea would be to run XP as a virtual machine under your current OS if you still need to do some testing under XP. If you have an XP Setup ISO or an XP installation disc, creating a virtual machine running XP is much easier, but if you don't, you can follow the tutorial below to install XP Mode under Windows 10. It works for Windows 8/8.1 Pro as well. a) The resulting virtual machine will run XP non-activated, without a license key, and you can use it for 30 days before it locks down. After the 30 days run out, you can re-create the virtual machine once again and use it for another 30 days, and so on. This is definitely not convenient for continuous use but will due just fine for testing old software or malware, for example. Alternatively, if you have an old XP license lying around, you can use it to register this installation. b) If your Windows 8/8.1 or 10 does not include Hyper-V (test that by doing step 4 below - the Home editions for instance don't include Hyper-V), then you won't be able to do this tutorial. You can still create an XP virtual machine using VMWare Player or VirtualBox, by following this tutorial: "How to test Windows 10, 8, 7, Vista, XP for Free, Legally". XP Mode is available for download directly from Microsoft: Download Here. Clicking the red download button on that page will give you the choice in the image below. The difference between WindowsXPMode_en-us.exe and WindowsXPMode_N_en-us.exe is that the version with N in it does not contain Windows Media Player. Choose the one you want, click Next and continue with the download. Alternatively, you can download WindowsXPMode_N_en-us.exe from Developer Link 3 on this page on Download3k. Note: If you are unable to do step 2 and 3 below, using 7-zip, then you can try a different compression utility, such as WinRar, WinZip, Bandizip (one of our favorites here at Download3k), etc. This problem has been pointed out a few times in the comments section. Download 7-zip (Download3k mirror) and install it. It's important to install the 32-bit (also called x86) version of 7-zip for a 32-bit operating system and the 64-bit (also called x64) version for a 64-bit OS, since the x64 version won't work on x86 and the x86 version won't run with context menu on x64 machines. We'll need context menu for 7-zip to make extracting easier. Skip to Step 3 if you know what type of system you're in. a) Press Win+X (this opens the Power User Menu) and select System. Look under System > System type for the OS type you have installed. b) Click Start (or press the Win key) and type PC Info. Look under System type and find out the type of OS you're running. Now that you know what type of OS you have installed, download and install the corresponding version of 7-zip. b) After extraction. browse to Sources and notice the xpm file. Right click on xpm and choose 7-zip > Open archive. Quick tip: If you don't see the Sources folder at this time, go back one step and from the same 7-zip right-click context menu, choose open archive as CAB, instead of extracting to "WindowsXPMode_en-us", then pick up from there. c) Extract it to a location of your choice. Rename it to VirtualXPVHD.vhd. d) Clean up. You can go ahead and delete the file downloaded in Step 1 and all the other files extracted from it, except for VirtualXPVHD.vhd. In order to use the .vhd image in a virtual machine, you can either use VirtualBox or the built-in Windows Virtualization called Hyper-V. Since VirtualBox is currently experiencing some bugs under Windows 10, we'll cover the Hyper-V method below. By default, Windows 10, just as Windows 8 did, comes with a few features disabled, including the Hyper-V technology. a) In order to enable Hyper-V, you need to go to Win+X (opens the power user menu) > Control Panel > Programs > Turn Windows features on or off, under Programs and Features. Alternatively, you can open the Run command (Win+R) or do a search (Win+S) and enter optionalfeatures, then hit Enter. b) This will open a new window where you must tick the box near Hyper-V, as shown in the image below, then click OK.
You will be prompted to restart. Do so. Upon re-entering Windows, Hyper-V will be enabled. The image above shows the Hyper-V options under Windows 8.1 - it looks similar in Windows 10. If some of your Hyper-V options are grayed out, you should restart, enter BIOS and enable virtualization there first. BIOS menus are different from manufacturer to manufacturer, so you should search for settings regarding Virtualization, Data Execution Prevention (DEP), and SLAT. Enable them and restart. If you don't see Hyper-V Platform or it appears grayed out in the 'Windows Features' window above, then you won't be able to create a virtual machine using Hyper-V.
a) Open Hyper-V Manager by clicking Start (or press the Win key) and type Hyper-V Manager, then Enter. Alternatively, you can open Start or Run (Win+R) and enter Virtmgmt.msc, then Enter. b) Make sure your local virtualization server is selected. If the left pane shows no Hyper-V servers (your local host computer) to connect to, then select the "Hyper-V Manager" in the left pane, click "Connect to server" on the right pane, select "Local computer" in the dialog that follows and click "OK". c) Optional: if you need an internet connection for your virtual machine, you need to setup a virtual switch by going to Action > Virtual Switch Manager, in the Hyper-V Manager window. Here you can create an External Virtual Switch, linked to your physical network card. Make sure the box Allow management operating system to share this network adapter is checked. This default type of network connection does not work for XP and Vista so, if at the end of the tutorial you still don't have an internet connection for your XP VM, see the troubleshooting part. d) Click Action > New > Virtual Machine. This will open an wizard. e) Click Next and, in the next window, specify a name for your server. g) Specify an amount of RAM in the next window. 512 MB or 1024 MB should do it. h) In the next window you can configure networking. If you need to use internet, you must redo the procedure from step a) and don't skip step c). If you don't need internet for your XP VM, press Next. i) Select Use an existing virtual hard disk and browse for the VirtualXPVHD.vhd file from Step 3, as shown below. The Location path will vary in your case. j) Click Next for Summary, then Finish. Your XP Virtual Machine is now created. You need to connect to your newly created XP virtual machine and start it. There are several ways to do that. 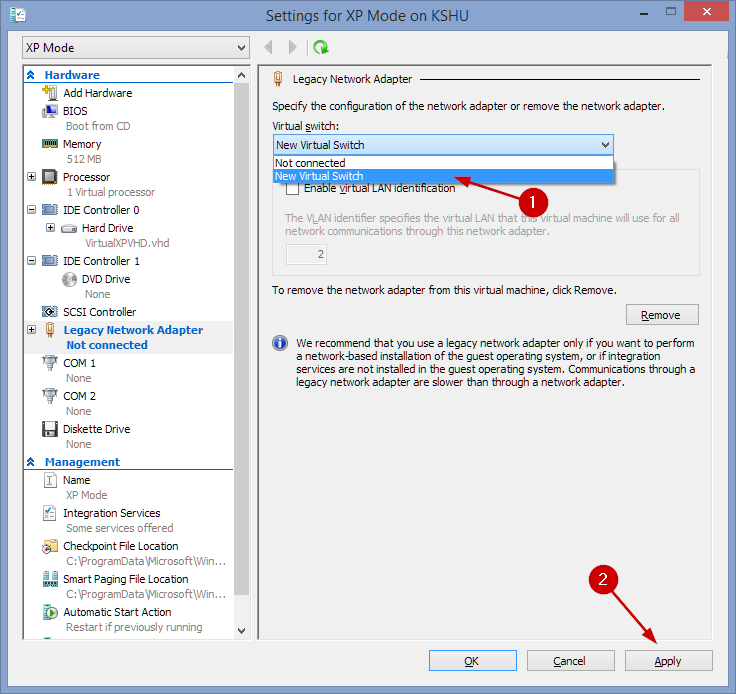 a) One way is to click Connect under your XP VM, in the right Actions column, as shown below. b) In the new window that opens, click the green Start button. See the image below for clarification. c) The first time you start the VM, it will do the last steps of a regular XP installation. It won't go through the full XP installation, but you'll still need to agree to Terms, pick a computer name, set time and date, language and, after a final reboot, it will prompt you to configure updates. That's it. If everything went ok, you should now have a working XP Virtual Machine inside your Windows 10 (or 8). Bonus tip: Create a shortcut for this Hyper-V Virtual Machine. Alternatively, you can read this guide "How to test Windows 10, 8, 7, Vista, XP for Free, Legally" and see if it suits your needs better. Turn off the XP Virtual Machine. - a) From the Hyper-V Manager, select the XP Virtual Machine and, in the right hand pane, click Settings. - b) If the XP VM window is active, you can click File > Settings. In the Settings window, simply Add Hardware > Legacy Network Adapter. The Add Hardware option is the first one in the Settings window. Make sure the Legacy Network Adapter is set to use the previously created Virtual Switch (External). Click Apply/OK and start the XP VM again. It should result in a quick driver install in the VM and, afterwards, the network should work inside the VM. Looks like FUN -- for a programmer. Isn't there a less complex approach? There are endless comments and links and downloads to confuse average people (me). But I gave my Sony with XP last year. Where were you then? What I CAN use is current updates to browsers (chrome) for a Vista OS 32bit. I like my TOSHIBA with VISTA! Way better that my "new" cranky windows 10 on a DELL. I use Vista for my many of hundreds of older programs that I can't part with. Like MS OFFICE (why pay for it with every OS upgrade?? Dumb. It basically shows you how to connect to the VM via remote desktop connection instead of the regular hyper-v way. When connected with a remote desktop connection, you can use local resources as well, such as printers and USB. You may not even need to go that far for what you need. Simply creating a shared folder between the VM and the host might work. So, I believe I've resolved an old issue which was "What do I do when XP expires on my Hyper-V VM?". I have source files I need and don't want to lose. Once XP expires, you're toast and you can't get to them and need to re-install XP. If t his happens to you the files are accessible by right-clicking on the VHD file and copying them to another drive. Unfortunately you still need to re-install XP but at least you don't lose your data. After completing all of the steps through #5 the manage -HyperV window indicated that no virtual window was found. What should I do? Find an old version of xp online. Mine activated no problem. If anyone can figure out why there's no sound or proper video drivers please post. Still no luck getting XP activated, phone support for XP activation has been discontinued. When I attempt to activate on the XP VM I get "Online activation can not be completed at this time.". I'll report back if figure it out. Thanks. I have not tried to activate XP recently so I can't advise you on this one. If you do manage to activate it, I'd appreciate a follow-up here, with your recent experience. So, although I now have connectivity to the internet I'm unable to activate Windows XP. I select "Activate Windows" from the Start Menu but after some time it says it can't connect to the Activate Server. I wonder if this feature is still enabled? It appears that someone attempted to activate their license not that long ago but I also see your comment about needing to reinstall Windows XP every 60 days when it expires. Perhaps I need to call Microsoft Support as someone else tried. I have a valid license but just can't get a prompt to enter it on my VM. Excellent suggestion. I do get a response when I ping google.com and other sites. I brought up the browser this morning in the XP VM and discovered that it had upgraded to IE 8 (I had automatic updates turned on). I'm now able to reach Google, though it's slow. Thanks for your help! What happens when you open a CMD and ping google.com or other sites? Thanks for confirming your process kshu. I deleted the legacy adapter and created it again selecting my wireless network. When I restarted my XP VM I do get www.msn.com by default with the latest news. I can also browse for www.microsoft.com but most of the graphics did not load, just a bunch of text links like "Home" and "Store Home" along the left side of the page. It fails on www.google.com and other popular sites. I turned off the firewall and it didn't help. Same problem with the console or remote desktop. Seems like some soft of security issue on the VM? Hi djoy. I made no changes to TCM. I kept everything default and I only created a virtual switch with the following options: external network and "allow management etc". Then added a legacy network adapter using that network switch. And it worked. I have not tried this in a while, but I doubt it won't work due to changes in the latest Win 10 update. kshu. Great article, thanks for all your help. Sadly, I have one big problem yet, no internet on my VM running XP Pro. I've tried the steps above, "Make the internet work on the XP virtual machine. ", but no connectivity. I'm running Windows 10 and work wireless from home. I have XP running, it generates a valid IP and I can connect to it via Remote Desktop. However, no internet. Are there any IP changes I need to make to TCP on the VM? Just a heads-up, I have lots (OK, 4) old XP Home licenses, but this requires an XP Pro license. It defaults to using my old Windows 7 license, but I contacted Microsoft, and they said I can't use that license because it's already in use for my Win7 -> Win 10 installation. thank you, Kshu. I waited (for an hour) and the xp activation never popped up. so I did the other thing very carefully and I get the message that "windows cannot find..."
I have rechecked what I typed several times. any other way? Hi @kathyd. If you wait a few minutes, the XP activation pop-up in the bottom right system tray will pop up. If not, you can go to Start > Run, then type "%SYSTEMROOT%\system32\oobe\msoobe.exe /A", without the quotes. You will get a message telling you if XP is activated or not. If XP is not activated, you can continue with entering the product key. hi, I have followed your instructions and have XP now loaded and working properly in the Hyper drive on Windows 10. Now I have found my old XP product key and want to install it before the deadline. I can't find where to do that. I am not very "techie", so if you could dumb down any instructions, I would appreciate it. I have an Epson Perfection 3200 Photo flatbed scanner, whose control panel software only works under Windows XP. I built my 64-bit PC with Windows 7 Professional, which could not run the Epson software, even in compatibility mode, but I was able to install the emulator (VirtualPC and WindowsXPMode_en-us.exe) and it worked fine that way. Incidentally, I didn't have the 30-day registration limit, either. Life was nice. Then, Microsoft released Windows 10, and I'm pretty much obligated to move to the new OS (I'm of that sad species known as IT support). Of course, VirtualPC didn't migrate over to Windows 10, and I couldn't find an equivalent arrangement using Hyper-V. The instructions on this article are the closest I've found, even after asking on the Microsoft forum. I installed Windows XP on Hyper-V using the same WindowsXPMode_en-us file that I used for Windows 7, per the instructions in this article. Of course, now I have a 30-day registration notice. I installed my Epson software, but I cannot get the VM to see my USB devices (such as my scanner). I have the option to use Enhanced Mode when available, but it is grayed out in this case. I found a Microsoft page that says to use VMConnect, but I can't find the "Show Options" button that it shows in its illustration. Does anyone have any suggestions how I could get my VM machine to see my USB scanner? Well, a checkpoint does include the programs installed and all other changes done to the XP VM up to that point, but it does not freeze the 30 days activation period. If you do activate the XP VM with your existing XP license, then you should be able to use it without having to reinstall it every other 30 days. Maybe also create a checkpoint for backup reasons. If you don't have an XP license key, you can re-arm the OS 4 times (120 days), logged in as administrator. In a command prompt, run C:\windows\system32\rundll32.exe syssetup,SetupOobeBnk. You won't get a confirmation message or anything. You can re-arm 4 times if the 30 days trial hasn't expired yet. If the 30 days period has expired, you can only re-arm 2 more times, and you must log in in Safe mode first. Hm, that surprises me, I wood have expected the checkpoint snapshots to include the software I installed on top of it (what about all those Windows updates, would those have to be re-installed as well..? There are still a good bunch of them based on MS's official XP Mode image). Either way, I still had a version of XP on a older laptop in my garage; I could use its license to activate XP in my VM so fortunately I no longer have the silly 30 day problem. Again thanks for your time a drink expertise! svenf, you'll need to reinstall the programs each time you rebuild the vm, but if you do find a workaround for this, please share it. To make the process of recreating the VM easier, you can create one checkpoint before step 6 in the tutorial above, just before starting the Windows XP VM for the first time, and just use that checkpoint instead of a complete re-install of the VM. Hi Mihai, thank you so much for your effort to put together these instructions, everything works just fine for me on Win 10, including web access in XP. One question - your comment "re-create the virtual machine every 30 days" - do I need to re-download a fresh vhd file every time or can I just re-create a VM as described and point to the previously used image file (so that I don't need to reinstall the software I want to test every time that happen)? Glad to hear that, @alexfrantiuc. Regarding vm-host sharing, see a few comments below. You can basically try a regular shared folder via the local network. The XP vm and the host must be on the same workgroup. Thank you for the article, it worked from the first try. I have a small questions: How do I move files from my win 10 to the virtual XP? Or maybe there is a solution to connect my external hdd or the other partitions? The downloaded XP file in step 1 does not show 7-zip (V 15.14) when you right-click. It is a self-extracting .exe file. When I click "open" or "run as admin" I get "Windows XP mode is only on WIN 7 operating system"
I have a notebook computer running W7p64 on which I've installed the VM and XP emulator. * This allows me to run software that accesses a serial port (in this case, a USB-to-serial adapter) so I can communicate with my Parasound system controller, LEGO ris tower, and obsolete Brother "PC" label-making machine. If I install W10 over W7, what will happen? Will the VM be wiped out and have to be reinstalled? Or will it continue and the apps continue to operate? * For some reason, my desktop -- also running W7p64 -- refuses to install the VM. This isn't a problem, though, because the ProBook 4530s, being portable, is a much more convenient platform for addressing the controller and tower. Thanks again kshu. The shared folder works as you suggested (I don't know why I didn't think of it...) But I tried the link you suggested to get the RDC. Following the instructions it works but one way only. I need to repeat the process and see why theVM can see the host but not the other way around. Thanks again. Don't know about the frozen mouse problem, I haven't experienced that at all. Maybe reinstalling the mouse drivers would help. Unfortunately you were correct about re-using my Virtual PC/XP-Mode license #! It will not work. So following other comments I found, I called Microsoft! BIG WASTE OF TIME. First, I had hard time with the language barrier. Second they refused to understand my comments or replies to their statements! I tried hard to get them to explain why in Windows 7 Pro, I could install Virtual PC then get a free XP Mode license, but that license applied to me on the same PC would not be available on my upgrade to Windows 10! Anyhow, they continuously warned me about using XP because it is no longer supported by Microsoft for security updates. I informed them that did not matter to me as I did not use it on the internet, but only to run a database program with all my records and forms that the manufacturer stop supporting or upgrading after Win 95, but it would run on XP. I also informed them the program mfg site denoted to run the program in a VM! So now when I launch XP in Virtualbox , it tells it is not genuine! I do not really care if it is genuine, I got it from MS! So I launch Virtualbox, open my XP VHD, launch my program, use my thumb drive to access and update my database, print the needed forms , save, close and then back to Win 10. Does anyone know how to access a USB storage drive from the XP Virtual Machine? The Device Manager in the System info does not show a tab for USB although the XP machine was created using the VirtualXPVHD.vhd file from the download link in the instructions above. Also, has anyone solved the frozen mouse problem yet? XP Mode comes with a pre-installed license key. Once you extracted the .vhd and ran it in Virtualbox, it became a regular XP virtual machine, not an XP Mode. Therefore I don't think the included license key will work here. If you talk to MS about this problem, I'm curious of what solution they will provide. If you don't mind sharing the experience afterwards, I'd appreciate it. Hi Jtdemag24. If the old VHD is a file with the .vhd extension, then yes, you can probably use that .vhd file with this tutorial. You can skip steps 1-3. I have been reading these comments and did not see one that details my concern. I have a Win7 Pro desktop that I have virtual PC /WinXP Mode running on. I now upgraded to Win X and then learn Virtual PC but no XP-mode link. I activated Hyper V and now can see my VHD from previous virtual setup. (my computer) Is there a way to use that VHD? Or do I still need to download the new "WindowsXPMode_en-us.exe"? If so what then should I do with that VHD "D:'? Delete it? Interesting that on the VHD I can find the old XP games such as solitaire, pinball, minesweeper, etc. and that they will open and play, just cannot find the XP operation system! Hi Woody1996, this tutorial decompresses the entire content of the file downloadable from microsoft. Once downloades and decompressed with 7-file or WinRar (I've used WinRar as kurxos) you will find a folder. Inside this folder there is a subfolder called Sources that contains a file of 478955Kbytes called simply xpm. Right click and extract the content of this file on its same folder (xpm~). Inside this xpm~ folder you will fins the 1.182.241Kbytes VirtualXPVHD file with no extension you must rename to VirtualXPVHD.vhd (simply adding the dot and the vhd extension). Hope it will be useful for you, and finally you can enjoy Age of Empires again. Hi kshu. You are right. I moved the .vhd to C drive and it worked. Thank you for your help. It has accepted my registration key happily and all is well. Do you know where I can find instructions that will show me how to read/write to my actual D drive? I'm thinking maybe the .vhd file is corrupted or is found in a location that can't be accessed by Hyper-V.
An error occurred when attempting to retrieve the virtual hard disc "\\MYSERVERPC\Data (D)\Drivers\Win 10\WinXP Mode\VirtualXPVHD.vhd" on server DAVIDPC. There followed more information such as "Failed to get the disc information"
and "System cannot find the file specified"
"The Virtual Machine Management Service encountered an error while configuring the hard disc on your Virtual Machine". After that the only logical choice was to "Cancel". What exactly did you do in step 5i? Did you browse for the VirtualXPVHD.vhd file on your disk? Hello kshu. The size of my VirtualXPVHD.vhd file is reported variously as 1,184,290KB in the folder window details and as 1,212,712,448 bytes in the properties dialog if I right click on the file. The settings window on my machine are the same as the image that you provided except for one small detail - the Hard Drive under the IDE Controller 0 is named "New Virtual Machine.vhdx". I saw the comment from @aaaa but since I was making progress with your help and with the suggestion from spiritboar I carried on. You might be interested to know that afetr I submitted my last comment I noticed that in the BIOS settings CD was the priority of the boot order. I put in my old WinXP installation disc and it looked like it was installing from 'scratch'. However it eventually said that it was the wrong disc. I had another installation disc which I tried but that disc was not recognised at all. In step 3c, what is the exact size of your VirtualXPVHD.vhd file? In the settings window for your XP VM, do you have IDE Controller 0, in the left pane, set to use VirtualXPVHD.vhd as a hard drive? The settings window for the XP VM looks like this http://www.download3k.com/article_images/0/770/full_15_ef1a23708252a9717091d0b4b6775371.png (ignore the arrows there because the screenshot was taken for a different step in the tutorial). Earlier in the comments, @aaaa encountered the same error. He said that "I solve problem, when I delete all files and repeat installation". "Boot failure. Reboot and Select proper Boot device or Insert Boot Media in selected Boot device_"
This lets you extract the correct files including the 'sources' folder. Are you using 7-zip or another archiver? You could try Bandizip as an alternative. Making an XP VM is also easier with this tutorial: http://www.download3k.com/articles/How-to-test-Windows-10-8-7-Vista-XP-for-Free-Legally-01181. Thank you for the swift response to my query. I downloaded the file as directed and it is reported as being 469MB. Unfortunately when I open the archive the list of files is the same as I mentioned previously and 'Sorces' is not one of them. I have repeated the sequence of downloading and extracting very carefully a total of 4 times now - always with the same result. I downloaded from both of the sites that were suggested - witht he same outcome each time. Any other ideas? Try this, djw4250: http://imgur.com/a/4dq86. Then follow with step 3c from the tutorial. After downloading WindowsXPMode_en-us.exe check to see if it has the correct size on your disk, 469.8 MB. Hi - I'm stuck at step 3b because I cannot locate 'Source' after extracting the downloaded file 'WindowsXPMode_en-us.exe'. I can see 4 items - .rsrc; .data; .text; CERTIFICATE; but no Source. What have I misunderstood? @aaaa, this might be exactly what you're looking for http://www.techrepublic.com/blog/windows-and-office/make-usb-devices-accessible-to-a-windows-xp-virtual-machine/. It's a lengthy explanation so I rather not cover it here. Sorry, but I solve problem, when I delete all files and repeat installation. Now I need to add existing HDD to see it from XP machine, as weel I did not find, how to attach USB ports to machine... Can You help ? I have old HP printer-scanner HP Color LaserJet 2840 and scanning software don't exist for Win7-Win10. When I try Install it on machine - I get message, that I need USB ports. Probably software think, that printer attached to USB, but I have printer in network. Thak You. @aaaa, in step 3c, what is the exact size of your VirtualXPVHD.vhd file? Boot failure. Rebout and Select proper Boot device or Insert Boot Media in selected Boot device. Re: memo on Jan. 3 statement: "Also I don't see any of the drives of the Lenovo. When I installed xpmode on a windows 7 machine I used to be able to see the other disks as shared disks. " I have not seen comments on this issue. I have same problem, to overpass it I make some "tricks" saving files in Dropbox (back and forth). Re: Memo - to release your mouse cursor press ctrl+alt+left arrow which will release your cursor into the "root" OS. Each time you click into the virtual machine, you'll have to follow the above step to get back out. I followed the directions above on a windows 10 professional Lenovo. XP loaded but the mouse is trapped in side it until I shut it down. Also I don't see any of the drives of the Lenovo. When I installed xpmode on a windows 7 machine I used to be able to see the other disks as shared disks. I also have a question regarding registering windows. I have old CDs with windows xp on them and I have the number I used. I assume I use those numbers to register this windows but I don't know how. Thank you for such clear instructions. Everything went well except the VM will not connect to the internet. I loaded the Legacy, now when I go back to its settings it is greyed out. Any help on this? Glad to hear that, ik2rpe. Merry Xmas :). tylerkveinot, I'm happy to see you found a solution as well. Thank you for the Xmas gift. Everything is now perfectly working with great joy. Excellent article very easy to follow. I was hoping I could still use XP mode in Windows . I like playing StarCraft Brood war hope it still plays well on my new rig. ik2rpe, try running this command in a cmd: bcdedit /set hypervisorlaunchtype Auto. Then reboot. If it still does not work, try checking BIOS settings again and look for virtualization options. Also consider doing a BIOS firmware update, if one is available from your motherboard manufacturer. It simply doesn't exist, but I got the game working using DOSBOX so my root issue is solved now. Hi ik2rpe. Do you have the option "Hyper-V Platform" in step 4b or is it grayed out? Impossible to start "XP Mode 4 Money". Do you have Windows 10 Home? The Home edition does not include Hyper-V. You can try a different approach: http://www.download3k.com/articles/How-to-test-Windows-10-8-7-Vista-XP-for-Free-Legally-01181. Tried this but when I go to Turn Off and On Windows Features there is no hyperV or Hyper anything in the list; what do I do? Mr. Chen had the same problem, and worked around it by adding Hyper-V manager as an Snap-in component to a blank MMC console as Mr. Chen suggested. Thanks for the tip kshu - that was easily done! @tallboyrip, with Hyper-V you can also use Checkpoints (previously called Snapshots), which basically work like a restore point. You can do one before the trial period expires and then revert back to it anytime you wish. Later edit: I'm afraid Checkpoints won't work either because they will not revert the trial expiration date too. However, you can create one checkpoint before step 6 above, just before starting the Windows XP VM for the first time, and just use that checkpoint instead of a clean re-install of the VM. Thanks for the tip kshu. I just got a Microsoft reminder that I have 17 days left to activate Windows XP. Let's hope (when I try registering the product key) it works! When setting up XP I chose not to connect to the Internet (as I don't have any XP stuff that needs an online connection) so I'll have to use the telephoning system. @alphaalexl, what edition of Windows are you using? The Home edition comes without Hyper-V for example, in which case I recommend VMWare or Virtualbox via this guide http://www.download3k.com/articles/How-to-test-Windows-10-8-7-Vista-XP-for-Free-Legally-01181. @aucksy, you can just use File Sharing. By default, my XP VM and the host OS are on the same network. The XP VM has the name ie8winxp, so on the host OS I just open File Explorer and enter \\ie8winxp in the address bar. With File Sharing turned on, I can see the folders shared by the XP VM with other PCs on the network. Works the other way around as well: access the host OS from within the XP VM. You can find the name used by the XP VM on the network by simply right-clicking My Computer > Properties > Computer Name. For Windows 10, you can find the name of the host PC by doing: Win key + X > System. Another way of transferring files between the host OS and the VM is by setting up a remote desktop connection and connect to the VM that way. Then simply copy/paste between the VM and the host. Can anyone please tell me how do I do the most important thing i.e. to access my host machine files via windows xp? There's no HyperV folder in Windows Features. Im stuck. @adnan, @maggerbee I'm glad you found this guide helpful. @maggerbee sound works fine for me. Did you check under Device Manager to see if the sound driver is installed? @tallboyrip if you can't get to the Activate Windows screen, then you won't be able to use any key. Very helpful and easy method to apply..thanks for your help in easy way. Awesome tutorial! Allowed me to use my existing Windows XP Mode drive from before I upgraded to Windows 10. Then all I had to do was activate Windows using an old key I had. My only complaint is I can't figure out how to get sound to work. Where is the KEY file located & how do you access it? Can you access it without starting up Virtual XP or must you do it from within XP? Once I know, I'll give it a try. Hi kshu. I don't have an "Activate Windows" option in Systems Tools. However, I did install a routine written by a techie at How-to-Geek which retrieves your Windows Key. (He wrote this to retrieve his Windows 10 key after the free upgrade. It uses a VBScript Script file to retrieve the key.) It appears to work in Windows XP too and came up with a licence key, but where it came from, I don't know. Whether or not it will still work in 3-weeks time, remains to be seen! I also did as you suggested regarding the pipe - which all would seem very logical, following the screencast example, but alas, so far I haven't managed to get my Psion to 'talk' to the PsiWin application on the Virtual XP machine. I know the RS-232C-USB adapter works OK as I can get them to communicate using my Windows 7 netbook, so I'll have to try different physical USB ports and check the Windows 10 Device Manager to ensure the adapter is still listed as COM2. If you go to Start > All Programs > Accessories > System Tools, do you have an "Activate Windows" option there? If you already have a CD Key for XP, you could try one of these VMs for XP: http://www.download3k.com/articles/How-to-test-Windows-10-8-7-Vista-XP-for-Free-Legally-01181#download. I am currently using the one with "IE8 on XP" and it shows the 30 day activation check. Regarding the pipe, let's assume your host PC is named tallboyripPC and you want to use the COM2 in the VM. You should select COM2 from the Hyper-V settings and name the pipe com2, then enter tallboyripPC for the remote computer. Did you try it like this? Example, but for COM1: http://www.screencast.com/t/jPkp5rhkA. Regarding the pipe, I tried entering the name of my virtual machine (Hyper-V lets you choose which Com port you want the pipe to refer to) but sadly it didn't connect. There must be something more than just the name of the Virtual Machine require in the pipe name context. I'll keep searching. Regarding the XP activation, you can check that by going to Start > Run, then type "%SYSTEMROOT%\system32\oobe\msoobe.exe /A", without the quotes. You will get a message telling you if XP is activated or not. 1. Add "com2" (without the quotes) as the pipe name. 2. If it still does not work, you can add the name of the host, your PC, as the remote server on that same COM2 pipe configuration window. Your host name is the one highlighted in step 5b above. I need to use Virtual XP to run PsWin - the backup software for Psion Revo Plus & other Psion PDAs. I've followed the above (very clear) instructions and have XP working under Hyper-V on my Windows 10 system. So far, I've not been asked to enter a product key. Should I have been? Will it stop work / ask me in two week's time? Also, how do I link up to the physical Com2 port? Hyper-V says: "You can configure the Virtual COM port to communicate with the physical computer through a named pipe. If the named pipe is on a remote computer, you must also specify the computer name.” There are then two selection choices: none (no connect) and named pipe, with a space to enter the named pipe. Has anyone tried to wipe the xp part and install win 7 instead? Am trying it now and was wondering if there were any issues with doing this as i tried to activate xp and i don't have a key that will work? Also apparently the version of xp will not allow a straight upgrade to win 7. On Windows 10, I got to step 6b and clicked on the start button - instead of showing me the license screen, it went straight to the Windows XP Logon screen with user name XPMUser and blank password - oops! What do I do now? chief400, earlier in comments fred had the same problem and it appeared that his CPU was not 64-bit capable and was missing 'Hyper-V Platform' in step 4b above. Can you double check step 4b and see if you have all features available there? Also double-check your BIOS settings for virtualization options. On a side note, Virtualbox did the trick for fred, see the previous comments. I need a little help please. When I go into Hyper-V Manager there is not a virtualization server listed. I go over and select the "Hyper-V Manager" in the left pane, click "Connect to server" on the right pane, select "Local computer" in the dialog and click "OK". I get the message "an error occurred while attempting to connect to the server 'Danny's PC.' Check that the Virtual machine management service is running and that you are authorized to connect to the server. The operation on computer 'Danny's PC' failed: Invalid class." Any ideas on why this is happening? I'm very glad it worked for you, fred. kshu.. VirtualBox installed on Dell Inspiron E1705 32-bit machine running Windows 10 Professional. Windows XP Professional installed, then, Visual Basic Learning Edition installed on the XP virtual machine and everything seems to be working. Thanks for all your help. fred, if I understand this correctly, Virtualbox should run on x86 without a 64-bit processor: https://www.virtualbox.org/manual/ch10.html#hwvirt. kshu; VMWare also tells me that 64 bit processor is required. No way to virtualize Windows 10 on 32 bit machine. Windows 7 worked fine, but W10 has moved on. kshu....I just wanted to add a few more notes to what I had to do to create the Virtual Machine on my system. I had created the Vitual Maching and then installed Windows XP Pro from my source CD. Everytime I went to load my Quickbook Pro it would give me warning indicating there was not enough "space" to load the program, even though I had created a Virtual Machine with the size of 4GB. I then tried it again with 5GB, same results. Long story short.....I created a 4GB Virtual Machine and then when installing the XP Pro, I told it to set up a 2GB partition ("C") and another 2GB partition (which started out as "E" by default). I was then able to install the operating system and QuickBooks Pro okay and everything works just fine. That makes sense, fred. I added a clarification on step 4b of the tutorial, based on your feedback. Thank you. kshu. Using your information I found several places that indicate that Hyper-V Platform is available only on 64 bit processors. Mine is 32. Sounds like obsolete hardware vs new technology. Not worth the effort to provide the 32 bit drivers for obsolete hardware. Thanks again. It sounds like the Intel drivers might have something to do with it - you should have 'Hyper-V Platform' on level 2 there. If at some point you figure out what the problem is, feel free to share the result with us as well :). kshu. I get (level 1) Hyper-V. (level 2) Hyper-V Management Tools. (level 3) Hyper-V GUI Management Tools and, Hyper-V Module for Windows Powershell. There was a delay in receiving Windows 10 here. Messages to the effect that some hardware features on my computer had no drivers available and that I should contact Intel. Do you suppose virtualization on my processor is not supported in W10? Thanks for your time and insight. Don't waste any more time on this as it looks like the obvious bases have been covered. Best regards from Ohio. Hyper-V Manager. An error occurred while attempting to connect to server "D79Q4P91". Check that the virtual machine management service is running and that you are authorized to connect to the server. The operation on 'D79Q4P91' failed. Invalid Class. Looks like something is still missing. 1. In the left pane, select Hyper-V Manager. 2. In the right pane, under Actions, select Connect to server. 3. In the new pop-up window, select Local computer > Ok.
kshu. No virtualization server name beneath Hyper-V Manager in the left pane. Hyper-V took the check mark OK in step 4b. All the subs to it were also checked. railcrafter, I'm glad to hear that everything worked out ok for you :). fred, I added a screenshot for step 5b. Have a look and see if you see a similar option on your Hyper-V Manager. You should see a server name in the left pane. In step 4b everything looked ok? No grayed out options if you expand Hyper-V there? kshu...set up a network connection to my LAN and am able to connect to all of my computers. All I need to do now is install a few programs in XP Mode and looks like I am good to go. Thanks for your tutorial and suggestions. Helped a lot. Looks like Hyper-V will work for my needs. kshu...Activated Hyper-V, installed XP Mode, selected legacy NIC and everything appears to be working great. I am now able to run the XP Mode and connect to the internet. Will try to set up LAN next. kshu...I "blew" the hard drive, reinstalled Windows 7 Pro, installed all device drivers and updates. Everything checked out great. I then upgraded to Windows 10, again installed all updates including windows updates and device driver updates. Then reinstalled all programs. Again, everything checks out okay. No crashes on Windows Explorer or Internet Explorer. I wanted to check out each program over several days to make sure all is well.....and it is. I am now going to attempt to install Windows XP Pro using the Hyper-V virtual drive using your tutorial. I will let you know of the results. Great tutorial. Everything worked as advertised until paragraph 5.b. The hyper-v manager did not show any local virtualization virtual server, only an introduction screen. Clicking ACTION only showed connect to server, view and help as options. This was not surprising since no server was listed. I am using a Dell Inspiron E1705 which under Windows 7 did run Windows XP Mode successfully. Virtualization is ENABELED in the BIOS and Hyper-V runs OK. It appears that maybe Windows 10 does not support virtualization on my machine. Any thoughts? I wonder if it has anything to do with the version of BIOS installed? There are some later versions available, but Dell recommended using version A09 because the diagnostics run form the BIOS on later versions result in the blue screen. Fortunately, I was able to get the VMware working using your other tutorial. That's strange. "EPT * Supports Intel extended page tables (SLAT)" means it has SLAT so Hyper-V should work. It might just be a Hyper-V bug somewhere ... I don't know what else you can do about it. I looked in the BIOS and couldn't find anything about DEP or SLAT. The virtualization setting is under Performance and still set to ON. There is some processor info under System and one of the lines says "Hyperthreading Capable = No". There is no way to change that. I checked Windows Features and Hyper-V Hypervisor is still greyed out and still says "Hyper-V cannot be installed. The processor does not have second level address translation (SLAT) capabilities." I downloaded the Coreinfo and followed your instructions. The result: "Coreinfo.exe is not recognized as an internal or external command, operable program or batch file." I tried running Coreinfo.exe as admin and I could see it run and produce results but the window closes so fast and before I can read any of it. I couldn't pinpoint their exact locations because BIOS menus are different from one manufacturer to the next. Best way to find these settings would be to browse the entire BIOS menu. Another option is to use Sysinternal's CoreInfo.exe to determine if your machine supports Virtualization and SLAT. CoreInfo can be downloaded from http://download.sysinternals.com/files/Coreinfo.zip. 2. Extract it and move it to an easy to find location C:\coreinfo.exe. 4. Do "c:" and "cd\", without quotes. 5. Do "Coreinfo.exe -v", without quotes. I can check the BIOS for those things after hours today and let you know. Do you know where they would be located in BIOS? Besides enabling Hyper-V, do you have the options to enable in BIOS Data Execution Prevention (DEP) and SLAT? kshu, I just finished re-upgrading to Windows 10 and I looked at the message behind the greyed our Hyper-V Hypervisor. I does say exactly the same thing it did before I enabled virtualization in the BIOS: "Hyper-V cannot be installed. The processor does not have second level address translation (SLAT) capabilities." jdmyers, if you try the other tutorial and get stuck, leave a comment there so I know what steps are unclear so I can improve the tutorial :). kshu, the message you asked about was before the BIOS was corrected. I'll plan to upgrade to Windows 10 again tonight and let you know what the current message is. I don't have a problem trying the other method, but when I read over the tutorial, I found that it was telling me to make choices for certain steps that I have no way to know what to choose. kshu....I am probably going to "wipe" my main ssd and do a clean install. Probably will create a second partition and set up a dual boot system. One for Windows 7 Pro and then upgrading to Windows 10 Pro and one for Windows XP Pro. As I built this computer, I did not set up nor do I have a recovery partition on this particular computer. Need to do a little research on setting up a dual boot system. Haven't tried that before. I may attempt to recreate the Hyper-V system again with the XP Mode. I will let you know of my progress. jdmyers, you got the message "Hyper-V cannot be installed. The processor does not have second level address translation (SLAT) capabilities." AFTER you enabled virtualization from BIOS or with virtualization set to off? Is your Windows 7, the one you upgrade to Win 10, 32-bit or 64-bit? Right now, a really good option for you would be to just download a VMware-ready XP virtual machine and import it to VMware Player (free) - from the other guide you said you find difficult following: http://www.download3k.com/articles/How-to-test-Windows-10-8-7-Vista-XP-for-Free-Legally-01181 (recently updated with fresh screens matching the layout change of the Microsoft Modern IE site used). I did not personally test a VM import on Virtualbox or VMware Player under Win 10, but I assume it will work. I know the latest Virtualbox version has some incompatibility issues with Win 10 right now, so I'd go with WMware as a first choice at the moment. If you decide to follow that guide and run into trouble, feel free to leave a comment on the tutorial page and I'll try to help. I'm currently testing the XP VM with VMware and Virtualbox under Windows 10 myself so, if you wait a fee days, I might have a tutorial on those scenarios as well. railcrafter, I added my networking troubleshooting suggestion at the bottom of this tutorial as well, just to be clearer, with pics. It did work for me with a Legacy Network Adapter. Regarding your File Explorer crashing, you might consider first doing a Reset, with or without keeping your personal files: Settings > Update & Security > Recovery > Reset this PC. I'm assuming the File Explorer crashes in Windows 10. Or open an elevated cmd and try "sfc /scannow". If you're not familiar with sfc, then type "sfc /?" and see what it does. kshu...Yes, I will try your suggestion on the legacy NIC and let you know the results. Got some other work I need to do now, but will get to it later today. Thanks for your suggestions. Nothing to do with Hyper-V, but I am also having a problem with Windows Explorer "crashing" on me occasionally. I'm thinking I may have to do a clean re-install of Windows 7 Pro, upgrade to Windows 10 Pro, and then re-install my programs, etc. I can upgrade to Windows 10 again and see what the message is behind the greyed out Hypervisor. Will you be able to help trouble shoot it with me? I copied the warning message from the first time here previously. jdmyers, I don't think the old XP Mode on Win 7 is causing any problems with Win 10. The XP Mode in Windows 7 worked using Virtual PC. In Windows 10, Virtual PC is no longer active and have been replaced with Hyper-V. Also, this tutorial is only using the XP Mode file to extract the .vhd from it and nothing else. So I don't see a conflict between the old Win 7 and Win 10. Or maybe I'm missing something. Anyways, you can't make use of this tutorial unless Hyper-V is active on Win 10 Pro. In your case, it wasn't and I have no idea why. That warning message when hovering over the disabled Hyper-V Hypervisor could have provided some clues. I used 7-zip. I downloaded and installed it as per step 2 above. I don't know which version but assume it was the latest version. I didn't re-check the message for Hypervisor after changing the BIOS and I've already rolled back to Windows 7 for the 2nd time until we find out if we can get Windows 10 to work. I will say that when I rolled back to Windows 7, XP Mode would not work so I tried to reinstall it and it wanted the old one uninstalled first. Add/remove programs would not uninstall it. I finally got it off the machine using IO-bit Uninstaller. At that point I ran out of time to do the install so I don't know if this will be successful. Do you think this uninstall/old version issue could have been the problem after upgrading to Windows 10? 1. Turn off the XP VM. - a) From the Hyper-V Manager, select the XP VM and, in the right hand pane, click Settings. 3. In the Settings window, simply Add Hardware > Legacy Network Adapter. The Add Hardware option is the first one in the Settings window. 4. Make sure the Legacy Network Adapter is set to use the previously created Virtual Switch. 5. Click Apply/OK and start the XP VM again. It should result in a quick driver install in the VM and the network should work inside the VM. Let me know if this worked for you please. I will try Virtualbox or Wmware. However, should I be able to access my NIC from within the XP Mode under Hyper-V? Or, am I configuring it incorrectly? railcrafter, as an alternative, you could try setting up the VM with Virtualbox or Wmware Player. Both free, both working under Windows 10, both are more user-friendly with their settings. So, I had XP Mode working just fine on my Windows 7 Pro Desktop and ungraded to Windows 10 Pro. I got Windows 10 Pro working just fine on my Desktop and as I still have an accounting program that needed to run in Windows XP, I decided to attempt an XP Mode in Windows 10. I activated the Hyper-V Manager, created a vitual "external" switch and selected the installed Intel NIC. I then created a Virtual Machine, choosing Generation 1, set 2048 for Dynamic Startup memory, selected the installed NIC, Created a virtual hard disk, and then installed the Windows XP Pro from an installation CD. The install went well and the Virtual XP Mode appeared to be working okay, EXCEPT that it will not discover the internal Intel NIC. And so, I can't connect to the LAN or of course the internet. I tried installing the drivers for the installed NIC to no avail. The driver installation indicated that it could not discover the NIC. SO.......what am I overlooking or doing wrong? jdmyers, what software (including version if possible) do you use to unarchive WindowsXPMode_en-us.exe? In step step 4b, after you enabled virtualization in BIOS, if you hover your mouse over the grayed out Hyper-V Hypervisor, what message do you get now? Here's an update on what I've done after my last post. I rolled the OS back to Windows 7 and discovered my VM would no longer work there either. I went to the BIOS and found the virtualization was off (probably from a BIOS update I did a few days ago) and I turned it on. Then I reupgraded to Windows 10. I've started the steps here over again. The same issue exists on step 3a in that it only completes 99% and gives the same warning. It did create the files and allowed me to proceed, but once again on step 4b, the Hyper-V Hypervisor is greyed out. I proceeded anyway and this time on step 5c I got an error message while trying to retrieve a list of virtual switches saying the operation failed. I tried to get Microsoft to help me but that was a joke. Do you think this is something we can make work or should I stay with Windows 7? I guess I'm just going to give up and roll back to Windows 7. The other tutorial is just too complicated for me and I get stuck on a step not knowing what to do. Thanks. The greyed out Hyper-V Hypervisor shows "Hyper-V cannot be installed. The processor does not have second level address translation (SLAT) capabilities." Can you tell me what I need to do please? I will have a look at those errors later on and see if I find a solution for you. With it, you can create a VM running XP. The XP in the VM should be activated for 90 days - and from there you have 2 options: use an existing XP license to activate it, or use the Snapshots feature of Virtualbox to rollback the VM to a previous state. It's all covered in that tutorial. Overall, the steps in that tutorial are much easier to follow, with no need to extract the .vhd. The VMs come already prepared from Microsoft's servers. Okay, even though step 3a only got to 99%, it did create the file needed. I was able to continue the steps. However, in step 4b, when I checked the box next to Hyper-V, one of the sub boxes was greyed out and did not check. It was the Hyper-V Hypervisor. That is the error message I'm now getting in step 6b. How do I turn on a greyed out feature? I decided to start over once again but this time I downloaded the XP Mode file without the "N". Same exact issue and same warning message. Should I roll the OS back to Windows 7 because I have to have the Virtual XP available? I left the extracting running for about an hour and it never got past 99%. So I started over, this time downloading the files to my desktop instead of my file server. Same results at Step 3a, it got to 99% extracting and was stuck. Only one warning this time: "There are some data after the end of the payload data". 2 Can not delete output file : The process cannot access the file because it is being used by another process. I'm not sure what that means but it did extract the WindowsXPMode_n_en-us directory containing the sources directory which contains the xpm file. The 2nd issue I get in in step 3c during extraction of the VirtualXPVHD file. It gets to 99% copying and seems to stop. There is a message that says "1 Can not open output file : Access is denied. "C"\VirtualXPVHD". I'm not sure if that is okay or not but it did create the VirtualXPVHD file that I renamed to add the .vhd extension. Not sure, jdmyers. That's the exact error message you get? Nothing else? You performed all the previous steps correctly? I got down to step 6b and am stuck. When I click the green start button, an error message pops up that says: "XP Virtual Machine failed to start". The actions it lists to resolve the problem are not making sense to me. Can you help me? kos, you'll need to re-install all your programs again in the Virtual Machine running XP, created using this tutorial. The XP mode won't be preserved when upgrading to Windows 10. OK, I have win 7 running with virtual XP mode available. If I upgrade to the free offer of windows 10 and then follow the details above will I still have the XP programmes available or will I have to reload them all again in the virtual machine. i.e. does the virtual hard drive have my installed XP programmes? Thank you in anticipation of your help. a3k, using this tutorial, the resulting XP inside the virtual machine will not be activated, but if you have an XP license, you can use the license to activate it. I have it working,only without the internet connection,so i try again. The only thing i don't understand is why my XP dvd drive is not accesseable cause it has the letter D: and my W10 has the F:/ letter. And when i can register do i have XP for life or evenso for 30 days? I stopped this morning with it because i was stucked in the VirtualXPVHD. Now i can try it again, thanks m8. a3k, that's normal. It is supposed to be an exe file. Right click on the .exe file and see if you have your regular WinRar extracting options there. - right-click WindowsXPMode_en-us.exe and choose "Extract to WindowsXPMode_en-us"
Continue with steps 4, 5, 6 of the tutorial. I hope this helps. Alright, i forgot to install Winrar on my new W.10. So now i can unrar. It was not an exe what i download. I have Winrar on my PC,so when the file is downloaded it normely should open automaticly in Winrar.Thats with the most files i download. This one doesnt. It came in as an exe file kshu. That's because you are double-clicking the file downloaded in step 1 (WindowsXPMode_en-us.exe) and try to run it just like that. Instead of doing that, you should follow step 2, 3, 4, 5, 6 in the tutorial. Don' know if i git an answer,but i'll try. When i will install XP download it extracts but after that it says that it's only supported with W.7. After the message it stops and nothing happens. Ive downloaded it from your Microsoft link within. Thank you; you're a saint. I have successfully done everything, but I really don't know how I can put files in this virtual Windows now. Anyhow, I searched if there would be any other way of opening hyper-v but I couldn't find one. What should I do?